I got a memory foam mattress from Amazon. It is an 8” thick mattress. I cut the corners to fit the rounded corners at the foor of the bed. I did end up adding a 2” memory foam topper. It is now the most comfortable bed we have. Love it. A foam topper might help. Only advice from experience on boat and motorhome is don't bother with the real cheapos... not worth it. Any foam can be cut easily with an electric knife. Research a custom mattress factory in your region. They can make you one any shape you want. They will probably have a show room also so you can try them out first. Your best foam is latex in almost every way, but you will pay a premium for it. Twin at the bottom. If you want it to look right, have a ticking made to order, which is just a sewn case with a zipper to zip the Foam and batting together, basically making a custom topper. You will get quality, but At a different price point than the cheaper memory foam toppers. Our MS came with a custom mattress. It is fantastic, There is no name on it but I would go to one of the big boat shows there are usually a few providers there. One of the really nice things about the one I ordered from Amazon was that I paid extra for next day delivery. UPS apparently messed and did not make the delivery after complaining to Amazon they refunded me the whole cost of the mattress including the extra shipping and said keep the mattress. It is really comfortable especially since it was free. I've gotten three mattresses from them - they're great. Get 6 inches of the HD36, it's perfect. Get the HQ version if you want higher density to last longer. We have 5 inches for our v-berth beds and they're also great. If you need more softness you can order a slice of the soft memory foam for the top. It's cheap, they don't put fire retardent on them so they don't stink (so try not to smoke in bed), and they're wicked comfy. Oh, forgot to say, they're really easy to cut with a sharp kitchen knife. We cut our v-berth ones out of a full sheet. We had a dying foam mattress. We still have it. We added a 2" memory foam topper and it made a world of difference. 2 of them,, one for each side of the V berth. I cut it with heavy shears, my wife wrapped it in a sheet and it has been like that for more than 10 years. I think more like 15 yrs. Turned that uncomfortable old mattress into a comfortable one. It is now on the way out as even so it has reached the limit. But for the time, the cost and a bit of work it was well worth it. Other than a custom made mattress, I think the best option is "Tufted Topper", a foam padded topper that fits on top of your cushions. We had them on our last 2 boats. You cut a template of your existing cushions and Tufted Topper can get a custom topper back to you in about 2 weeks. We've covered our 4" cushions on our Nordic Tug's expanded v-berth with a Topper, and it's just as comfortable as our pillow-top mattress at home. TT also can custom-cut fitted sheets. Latex is king but heavy and costly. Folks that may winter aboard should drill holes under the mattress location to ventilate the bottom of the mattress. AS many sleeping locations are above an unheated storage area the ventilation will keep people moisture from collecting and finally freezing. This can happen even if an electric sheet is used. It is really comfortable especially since it was free. I have the same boat and HAD the same problem. 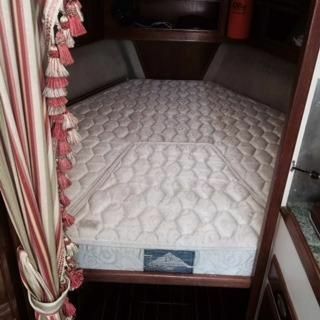 It's a two-part problem because one half of the mattress lives most of its life upside down hanging over the air conditioner, water heater, and bow thruster. It manages this by having a board included in its upholstery which is gripped in placed by screws coming through from the backk side of the hinged board it lives on. Since not much of our bodies rest upon the lower portion of the bed, we elected to ignore that harder-to-deal-with part and instead delt with the upper half of the hinged mattress which is not attached to the upper part of the hinged platform. I took it to a local upholsterer who has also done a lot of canvas work for me on my boats. There we discovered to my surprise the darned thing had inner springs - I assumed it was foam. He took the upholsterd cover off and filled it with 2 inches of memory foam over medium density foam, all wrapped in that gauzy stuff upholsterers use on cushions. Still too hard; so I returned it to have a less dense foam inserted under the memory foam. Viola, took a nap on just the upper part today, and it was great. Memory foam is a bit warmish, especially if in a warmer climate. We use a 3 inch latex topper on our cat. It has a series of holes in it 4 ventilation, can B cut 2 whatever shape U need & does not sleep warm. After some research, we purchased from Sleep on Latex. They have a variety of thickness & hardness levels, w quick shipping & easy returns. We have been very pleased w its comfort.